Sitting Bull College’s Linda Black Elk leads an environmental impact study on plants at Standing Rock, and works to decolonize medicine through Medic and Healer Council. Sitting Bull College instructor Linda Black Elk isn’t the easiest person to get a hold of—and with good reason. As an ethnobotanist who studies the way people use plants for food and medicine, her research interests have led her to become actively involved in the ongoing Dakota Access Pipeline opposition movement at Standing Rock. Black Elk now spends much of her time out of the classroom, traveling between two protest sites–Sacred Stone Camp and the Oceti Sakowin Camp. Both are within a few miles of Sitting Bull College on Standing Rock Reservation, and Black Elk has two active research projects unfolding there. “I want to show the wider public that this isn’t just about water. 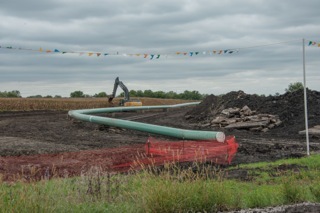 Water is the foundation of life, but more than water will be impacted by this pipeline,” she says. The projects grew out of a conversation Black Elk had back in April. LaDonna Brave Bull Allard, who lives on Standing Rock Reservation, told Black Elk that a construction company was planning to run a pipeline through the area near Allard’s land and under the Missouri River. Buffaloberry, or Shepherdia argentea, is rich in antioxidants and has been a staple in Native American diets of the northern plains for centuries. The slightly sour fruit can be eaten raw, dried, or used in puddings or sauces for bison meat. With the buffaloberry threatened, Black Elk did what any passionate researcher would feel compelled to do: document it. She began taking her ethnobotany students to the Sacred Stone Camp located on Allard’s land so they could do walking surveys and study the wealth of plant diversity there. They looked primarily at riparian plants—those that grow along the river. “We were looking at distribution, diversity, and population sizes. We were trying to ascertain whether or not there will be long-term impact,” Black Elk says. In addition to surveying the plants, Black Elk has been interviewing the people of Standing Rock to see how they use these plants. She will present her report to the tribe, and decide with tribal leaders whether or not to publish it. Black Elk’s next project evolved naturally from her work on site at the camps and knowledge of plant medicine. She now serves as an organizer for the Medic and Healer Council and acts as liaison between the medics, healers, and people in camp. In fact, medical services at the camp have filled in gaps for the entire community in this area of Standing Rock. Because Indian Health Services (IHS) in the town of Cannon Ball, North Dakota, is only open one day a week, tribal members have been visiting camp for medical care. Black Elk’s brother, for example, visited camp medics to treat a sore on his foot, choosing them over a trip to IHS. “Through IHS, it can take eight hours to be seen. In camp, people feel like they’re receiving care that’s much more culturally appropriate,” Black Elk says. Two months ago, the council began planning an integrative medical clinic that would last even after the camp ends. They envisioned a place for the community of Cannon Ball to be treated in traditional Lakota ways, along with acupuncture, massage, and other non-Western healing modalities. To bring that vision to life, the council has been working with physicians from the University of California San Francisco. These physicians offer extra insight specifically on treating elders and people experiencing mental health issues. “This would be a really good opportunity for everyone interested in indigenous public health and decolonizing medicine. This clinic will serve as a model and a place for people to hone their skills,” Black Elk says. Initially, the council wanted to build a traditional Native American longhouse for the clinic, but has since decided to share the IHS facility, as it is only in use one day per week. While there currently is no date set for opening the clinic, the Medic and Healer Council is working with lawyers to write up the clinic’s mission statement and plans to open in the near future. For updates on Linda Black Elk’s work and what’s happening at Standing Rock, follow her on Twitter or Facebook. Katie Scarlett Brandt is a freelance writer based in Chicago.